The Belgian Bishops have opened their churches to illegal immigrants in order to pressurize the Belgian authorities to allow the immigrants to stay in the country. Most of the immigrant squatters in the churches are Muslims. 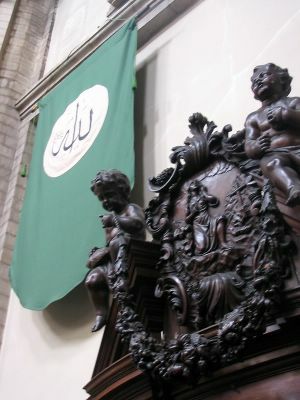 They display banners in the church showing the name of Allah (picture taken in the church of Our Lady of Perpetual Succour, Brussels). The Belgian Bishops are so ignorant that they do not see what is going on: their churches are being turned into mosques before their very eyes. 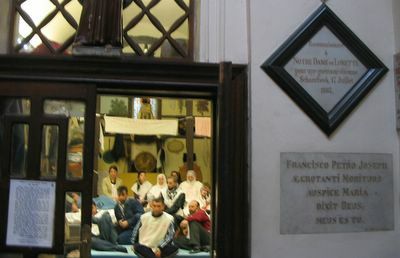 The Muslim squatters hold Islamic prayer services in the church. The altar has been moved and the statue of Our Lady covered by a cloth to hide her from the eyes of the Muslim believers. The squatters are living in the churches. "Church occupations" by illegal immigrants have been going on for a number of years in Belgium. They are not really "occupations" because the Bishops condone the actions and actively support them. Chris Gillibrand visited a number of Brussels churches to take these pictures. 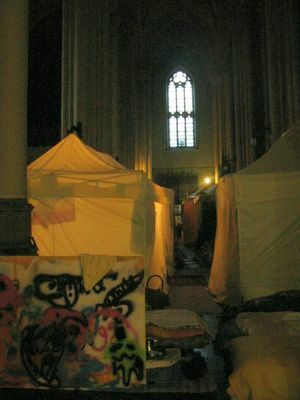 The squatters live in tents in the churches. The tents are being provided by Catholic relief organisations. They have also been offered radios, television sets and computers. Chris saw them light a fire. We apologize for the poor quality of the photo. The man was quite aggressive. Aggression in desecrated churches that are being turned into mosques with the approval of Cardinal Godfried Danneels. 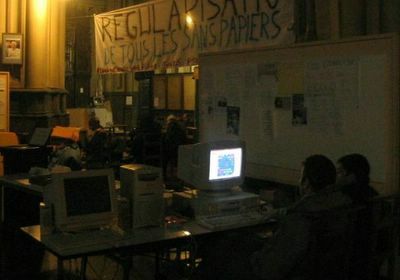 This is Brussels, AD 2006. Submitted by maryadavis on Tue, 2008-05-20 23:38. Churches from this area have already suffered from so many weather problems and from all the raining they had to do some flood damage repair. Ain't this enough? 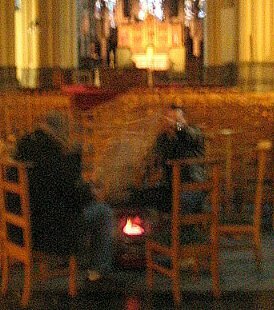 Do we really need bums to light up fires INSIDE the churches as well? Submitted by Carmela on Wed, 2007-02-07 18:18. The desecration taking place would certainly not be permitted to a mosque. It's difficult to comprehend why the Vatican would support such actions. Will they also be in favor of complete removal of the church? Christians need to communicate their anger to the Holy Father in large numbers. Submitted by Kapitein Andre on Wed, 2007-02-07 07:33. Submitted by Carmela on Mon, 2007-02-05 18:26. I'm just reading this article now...absolutely amazing! Is there an update to this story as it's possible that today it's no longer recognizable as a Catholic church? Submitted by BitShifter on Tue, 2006-11-14 10:56. What is happening here? Either the Bishop is too stupid or too kind. Either way, the events here are making both religions look stupid. Catholics because of their stupidity, Muslims because of their blatant disregard and respect for Catholicism. I'm sure both have pure intentions, but this has got to stop. Submitted by Taurus689 on Thu, 2006-11-02 15:39. It's incredible. Although I don't agree with the churches in Los Angeles harboring illegal Mexican & Central American immigrants, I can at least rationalize the Church's position in that they feel that they are aiding a group that is predominantly Catholic. But to offer asylum to members of a "religion" who would gladly put catholics to death when the time is right is incomprehensible. Yes Jesus turned the other cheek but he knew that he was coming back on the Third Day. Such power is not a available to us at least in this life. Submitted by FLLegal on Mon, 2006-10-30 10:33. The Bible does say that Mary is blessed. Jesus LOVES Mary His mother. Yes when Jesus left heaven to be born of the flesh through the faithful saint Mary, she was a Virgin. BUT after the birth of Jesus, she had other children giving Jesus siblings. She is NO LONGER a virgin. Jesus Christ is the only intermediary between God the Father and man. Mary can't save you. Mary can't answer your prayers any more than Moses can. Mary died. WHY? Why? Why? would one worship Mary, who did not die for the sins of the world,who is not God in the flesh, and who can't save one soul? She is also a sinner like all of mankind, but saved by the grace of God. She did not live a sinless life or the bible is not true when it said “for all have sinned and come short of the Glory of God”. Only God, i.e. Jesus Christ, has lived a sinless life. Only Jesus is the faithful High Priest and intermediary. See Book of Hebrews. REV 22:8-9 And I, John, am the one who heard and saw these things. And when I heard and saw, I fell down to worship at the feet of the angel who showed me these things. And he said to me, “Do not do that; I am a fellow servant of yours and of your brethren the prophets and of those who heed the words of this book; WORSHIP GOD! Who? GOD! Who? GOD! Jesus Christ, being God in the flesh is worthy of worship, but not the blessed servant Mary! Only God is worthy! Jesus is our faithful High Priest NOT Mary! Hey if it were Ok to pray to Mary, then it would be ok to pray to Moses, Peter, Paul, and John...BUT IT IS NOT! They are merely servants like Mary! Jesus is our intercessor and only He is worthy! Worship God you Saints! And yes if you are a Christian you are a SAINT! Submitted by FLLegal on Mon, 2006-10-30 10:08. I wouldn't worry. I suspect the true God of Abraham, Isaac, and Jacob and His Son Jesus Christ (God Himself who came in the flesh) has not been in this church or many so-called Christian churches for decades. Submitted by 100percentprochoice on Mon, 2006-07-17 17:40. That sounds as if one was better than the other. I want to be left in peace by all religions, NOT submitted to catholic beliefs neither muslim ones or anything else. If churches become houses... well, perhaps this would be a little bit better. The Formation of the "Beast"
Submitted by Kateria on Tue, 2006-05-09 10:46. Christians, we are witnessing the formation of the "Beast"...the last 'Beast' shown to Daniel the prophet, and the 'Beast' of Revelation - the Beast with the False Prophet, that also "beheads the saints". The Bible foretold that the whole world would follow after the Antichrist and 'submit' to him. Islam fits the bill perfectly for the religion of the 'Beast', but it will also be a political entity. Stats and reports are around that predict that Europe will be majority Muslim in 50 years or so, including Russia. The rate of Muslim 'immigration' and birthrates are exceeding native Europeans. The Christians of Europe have gone apostate, and Islam is filling the void. It's to the point where it is strong enough to actually demand that it fill the void. I've noticed for some time that the Left in particular bonds easily with Islam, leftist groups/dictators, and socialists. Now the Catholic Church is bowing to Islam. It is all coming together at an alarming rate. Submitted by FLLegal on Mon, 2006-10-30 11:13. 1) Europe will fall into the clutches of Islam and no longer be the Europe of old. Western civilization will die in Europe. It will become Islamic. 2) A "great man" in Europe will arise that will wage violent war against Islam saving Europe from the tyranny of Islam. He will be praised and given great political power. He will be a "savior" to Europe. We all will applaud his leadership in eradicating Islam from Europe. The only downside is that this man will eventually be disclosed to be the awaited man prophesied about long ago, i.e. the anti-Christ. We shall see and note I said I was not a prophet, but it is a gut feeling. But you may be right as to Islam from whom and through the anti-christ will arise for it too is a "spirit of the anti-christ". It too is evil falsehood. Gain Christian heaven by worshipping a demon? Submitted by telder1 on Tue, 2006-05-09 04:32. This is just one more demonstration of the Romanists seeking to make out that the 'real' Christianity is how one supposedly does emotion in 'free' will to a demon worshipper and that the only path to 'Christian heaven' or 'the one heaven we all wait/earn/work for' in keeping with 'we all worship the same God' is through the emotional common sense of the demon who is worshipped in the stead of Jesus Christ. Once one is deceived that heaven and hell will be full of identical creatures in two different places and that there is no new birth in Jesus Christ, 'heaven' becomes mere non-confrontation and any path to any emotional positive no matter what the consequences. Doing Jesus' as emotional etiquette to 'earn heaven' simply becomes the excuse for cowardice. All this will do is inspire more Islamics to greater impeity and ruthlessness against Christians. For certain men have got in unnoticed, they who of old were marked out beforehand to this sentence, ungodly persons , turning the grace of our God into dissoluteness, and denying our only Master and Lord Jesus Christ. Submitted by Baciagaluppo on Mon, 2006-05-08 18:45. This must be the ultimate camel-in-the-tent story. Only this time, the camels brought their own tents! No need for violence with a population as suicidal as Europeans now seem to be. Submitted by Cajun Nick on Mon, 2006-05-08 16:43. Belgium was twice blessed by visitations from the Blessed Virgin Mary, at Banneux and Beauraing. Those of you who believe in the intercession of the Blessed Virgin, please pray to Our Lady of Banneux and Our Lady of Beauraing for mercy. Submitted by leticia on Thu, 2006-09-14 14:03. Archbishop Fulton J. Sheen of 1950's teltvision fame, once predicted the mass conversion of Muslims through the intercession of Our Lady of Fatima. Thousands of Muslims already flock to Fatima, whose name is the same as Mohammed's daughter. Coincidence? There are 33 references to Mary in the Koran, she is revered as the virgin mother of the prophet Jesus. That is why conversion by means of her holy motherhood may well happen, and save us from the mess the world is in with Islamic terrorism. Let us pray. Submitted by Earl g on Mon, 2006-05-08 12:34.
will these quote-unquote well integrated immigrants share their new places of residence and worship with others of differing faith? Say...those that may be Jewish? Hindu? Buddhist? Or have these become exclusive places of residence and worship? Possibly even protected? Submitted by Jared Weber on Mon, 2006-05-08 11:08. Until Mohammed suppressed the rest, "Allah" was just one among hundreds of pre-Islamic pagan gods worshipped by the Arabians. So, why should they have ANY say about what goes on or gets displayed in a Catholic church? Submitted by Defender on Mon, 2006-05-08 08:01. 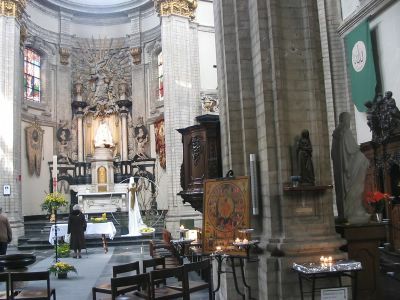 The fact that the Belgium government apparently is doing nothing about this disgrace, and the fact that the Belgium Catholics haven’t taken it upon themselves to free the church from the Bishop and his Islamic entourage, does not speak well of neither the Catholics church future nor Belgium’s future as a free non Islamic country. Submitted by G-Dub on Sun, 2006-05-07 23:24. Have you no shame? BOW DOWN BEFORE YOUR MUSLIM MASTERS! Don't like the sound of that? Tough. That' where you're going. Submitted by Catholicgauze on Sun, 2006-05-07 18:30. Hanging "Allah" all over the place? Covering up the Virgin? Does Catholic care? If I was given shelter in a Mosque I would be respectful of the Islamic religion and not demand non-Catholic things be covered up. Submitted by anglo-canadian on Sun, 2006-05-07 15:33. I wonder... if you're a white Belgian who's down on his luck and homeless, would a Belgian church give you shelter? Submitted by Pat Patterson on Sun, 2006-05-07 15:23. Instead of telling about the type of script used or the color of the banner, why not engage in a discussion on the issues involved? It's like trying have a discussion with someone who cannot debate except by throwing an encyclopedia and then running away. Submitted by Esther on Sun, 2006-05-07 17:33. The issue involved is whether Muslims are turning a church into a mosque. It is not enough to wave a banner with Arabic script when most people do not read Arabic and those who do would not recognize the word "Allah" in there. My point was to show that this is indeed a sign saying "Allah". There's of course a lot of room for discussion here, such as: do those church officials who donated their church are aware of what is going on there? did the Muslims using the church ask for permission for every step they took? etc, etc, etc. Submitted by karasoth on Mon, 2006-05-08 14:00.
so they give the squatters what they want. Submitted by Chris Gillibrand on Sun, 2006-05-07 20:21. In the case of St Boniface, the parish priest avowedly used the annual parish fair to welcome the "squatters". Some of the parishioners were not keen. Outside the Church were messages of support from "neighbours"- an exercise in enforced political correctness if there ever was one. The "sans-papiers" vacated during Lent and the Church was closed until Palm Sunday to remedy the damage done. The parish priest of Sint Kruis which has already been occupied by a group of Afghans in 2003 said when threatened with a repeat this year that he did not want them there in the run-up to Easter. In the Church of St Gillis, there was an expulsion by the police. According to the Brussels' Centre for Alternative Media (to whose website, I won't link), the 20th church was occupied on 2nd May. Some of the clergy are so keen to pursue radical left causes, that they forget the salvation of souls. Cardinal Newman said that all the suffering in the world was not worth the loss of one single soul for eternity. Harsh but true. Submitted by Esther on Sun, 2006-05-07 14:16.